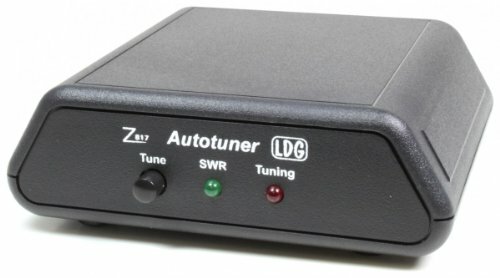 The Z-817 is the ultimate autotuner for QRP radios including the Yaesu FT-817(D). The Z-817 interfaces to the CAT port (ACC) on the back of the FT-817 radio with the provided cable. Tuning could not be simpler; one button push on the tuner is all that is needed and the Z-817 takes care of the rest. It will switch to PKT mode, transmit a carrier, tune the tuner, then restore the radio to the previous mode! 2000 memories cover 160 through 6 meters. Of course, the Z-817 will also function as a general purpose antenna tuner with other QRP radios. Just transmit a carrier and press the tune button on the tuner. The Z-817 is powered by four AA internal Alkaline batteries (not included), so there are no additional cables required to use the Z-817. Latching relays are used so that power consumption is Zero when not tuning allowing a set of batteries to last about one year. Battery operated 4 x 1.5V Alkaline AA (not included) - Dimensions: 5.1"L, 4.7"W, 1.7"H. Weight: 9.3 ounces (without batteries). If you have any questions about this product by LDG Electronics, contact us by completing and submitting the form below. If you are looking for a specif part number, please include it with your message.